by Myfrenchkitchen.In food, kitchen, objects, pen, sketchbook, watercolour.Leave a Comment on Bon voyage to Casey! Bon voyage to Casey.! May she have fun in Hong Kong, may they be kept safe and may she come back with great sketches! DITTO DITTO DITTO!! GREAT BOWL, TOO! Wonderful tribute to Casey. What a good friend you are. Great bowl!! Love the bowl and the chopsticks to illustrate the trip to the Orient. Oooh Hong Kong… I’ve never been there. It will be interesting to see Casey’s sketches. I like the colors and subject of your painting ! Wow – thanks Ronell! I’m not sure I’ll be able to reach this standard, but I’ll do my best. Such a pretty bowl! Reminds me how much I miss Chinese food. I lived in HK for a couple of years so really envy Casey. The sketch looks so real! !Well done! love chinese food! I have a bowl similar to your although I prefer to eat out! Love your wc sketch! I must try hot press paper! 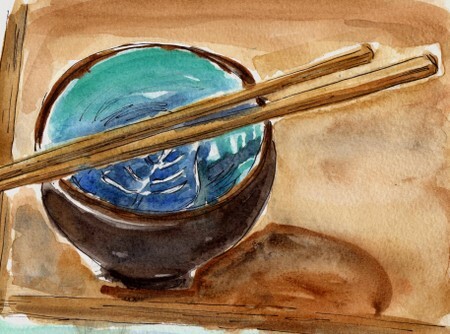 What a clever idea to paint a chinese bowl and chopsticks!! I LOVE it!!! And oh yes, we will look forward to seeing what Casey brings back. What a wonderful job. The perfect colur combination , perfectly balanced. It’s such a warm painting. And yes, I also hope Casey will surprise us with lots of stuff. I bet she is sketching right now as I type. I really can’t wait! Holy crap. I love how you handled the colors. Fabulous work, Ronell! I gave an oriental bowl and chopstick set to my daughter last year…same colours too. LOVE this!